As the weather becomes nicer bicycles are more and more prevalent on the roadway. Under Washington State bicycle laws, bikes have the same legal rights as a car. However, with the increasing number of bicycles on the road and the numerous distracted and negligent drivers bike versus car accidents are a reality. Bicyclist hit by a negligent driver often will endure severe injuries, which may lead to extensive medical bills, pain and suffering and lost time at work. In 2007 nationally there were cyclist 698 fatalities and 43,000 injuries. The good news is the numbers are trending down. The scary part about Washington Bike accidents is that if hit by a negligent driver, there is nothing protecting the cyclists. Most cars are now equipped with, bumpers, seatbelts, roll bars, front and side airbags and so on… On the other hand, the cyclist is completely exposed making it understandable why so many Washington bicycle accidents lead to emergency room visits. Also, remember that the average car weighs over 4,000 pounds. Just like any other Washington State personal injury case it is extremely important to document everything that occurs and came scrupulous records. If the cyclist has been injured by a negligent driver that at-fault driver will be responsible for compensating for any damages that stem from accident. Unfortunately, some serious injuries will be so serious that the negligent driver’s insurance will not be able to compensate your fully due the insurance policy limits. If this occurs it is important to look at other means for additional compensation. Some examples may be: a under insured motorist or uninsured motorist claim on your own auto insurance policy and/or possibly but more unlikely, your home owner policy. 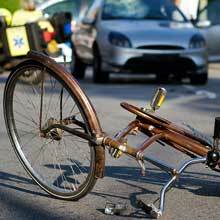 If you have been injured in a Washington Bicycle accident, you should contact an attorney as soon as you can. Most attorneys offer a free consultation. Please feel free to contact our office and schedule a free consultation. Joseph Rome and his colleagues will take time and as much time as needed to personally sit down with you and go over all the details of your case.